For the last few weeks I have been coming across such wonderful pumpkin recipes and have been filling my recipe binder with some new ones I can’t wait to try. I love pumpkin recipes this time of year and can’t believe I have only shared one pumpkin recipe that has been very popular, the Pumpkies. Over the weekend I finally dug in to my cute little pumpkins I picked up at the local nursery to make some fresh pumpkin puree. Now I have 48 ounces of pure fresh pumpkin to have fun with. For some, you may have your own little stash of fresh pumpkin puree too. I have talked to some people who have never made pumpkin puree before. For those who never made fresh pumpkin puree I will be sharing my method with you in my next post. In the meantime, lets talk about these delicious cupcakes. Last week a friend of mine emailed me and asked if I had any good carrot cake recipes. I have not made carrot cake in a long time but I do have a recipe that I use. Ironically the next day while I was doing some online reading I came across another Carrot Cake recipe on Made In Melissa’s Kitchen that I shared with my friend because it looks fantastic and was similar to my recipe. With all this talk about carrot cake and freshly pureed pumpkin in the refrigerator I thought what would be better but to blend the two together to create Pumpkin Carrot Cupcakes. I dusted off my old Carrot Cake recipe that I have been neglecting and put a twist on it to create this recipe. These are moist and delicious and the Pumpkin Cream Cheese Frosting is the icing on the cupcake! 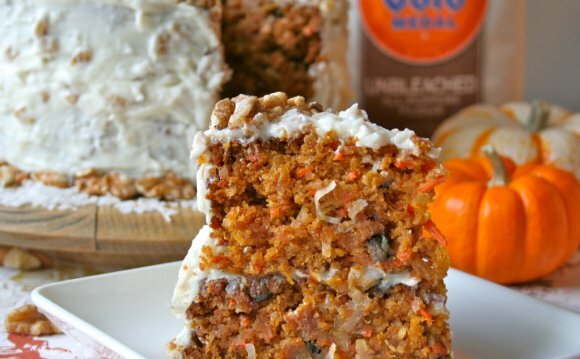 These are great made as cupcakes, or divide in to two 8″ or 9″ round pans to create a Pumpkin Carrot Cake. If you don’t want to make the frosting, another suggestion is to simply sprinkle with confectioners sugar and enjoy a delicious bite! In a large bowl combine oil. Lightly beaten eggs and pumpkin puree and mix. Followed by shredded carrots and coconut flakes. Pour in to lined cupcake tin and bake. Frosting note- start with 4 cups of confectioners sugar. If the consistency is still runny, add more confectioners sugar to thicken the frosting more. In a medium bowl stir together flour, baking powder, cinnamon and baking soda and set aside. In a medium bowl blend eggs, sugar, oil and pumpkin puree. Add in flour mixture until well combined followed by shredded carrots and coconut flakes. Pour in to lined cupcake tins ? full. Bake for 18-20 minutes until cake tester comes out clean. Using an electric mixer combined cream cheese, butter and pumpkin until creamy. Slowly add in confectioners sugar until all combined.